When did I conceive my baby? When to get pregnant to have a baby in April (or any other month)? How to calculate conception date (Conception Calendar Calculator). How to plan baby birth date (Birth Month Conception Range Chart). Select the event that will correspond to the date you will be selecting. The entry form will update to accommodate your selection. Select the month, day, and year that corresponds to the selected date type. If you selected "Ultrasound date" as the event, select the number of weeks and days along you are according to your ultrasound. If you selected a different date event, the fields on this row will be disabled. If you selected "1st day of last period" date to base the calculation on, select the number of days your average menstrual cycle lasts. If you selected a different date type, then the field on this row will be disabled. Based on your entries, this is the estimated conception date. If the calculation is based on Due or birth date, the result is 266 days subtracted from the selected due or birth date (266 is the average gestation period per Naegele's Rule). If the calculation is based on the 1st day of last period, the result is equal to the 1st day of your last period plus 14 days, plus your average menstrual cycle minus 28 days (30 days - 28 days = 2 + 14 = 16 days). If the calculation is based on the ultrasound weeks and days along, the result is equal to the ultrasound date minus the total days along (1st day of last period), plus 14 days (14 days after 1st day of last period). This is typically 14 days prior to the conception date (assuming ovulation occurred on day 14 of your menstrual cycle), though this can vary if a woman's average menstrual cycle is different from the 28-day norm. This is 266 days from your conception date. This free online conception calculator will determine the conception date -- including the day of the week -- based on your pregnancy due date, ultrasound, or the 1st day of your last menstrual period (LMP). Plus, unlike other conception calculators, this calculator includes selectable dates dating back 100 years, which means it can also be used to calculate conception dates and days of the week for any dates of birth occurring within the past 99 years. Want to know what date and day of the week you were likely conceived on? Simply select your birthday (or due date if you were born premature or late) and click the "Calculate Conception Date" button. Note that if you want to calculate what date your baby is due to be born on (EDD), please visit the Pregnancy Due Date Predictor -- which also includes How to Calculate Due Date based on Naegele's Rule. Or, if you'd like to track your (or a loved one's) pregnancy term, be sure to visit the Pregnancy Countdown Calculator, which tells you the days, weeks, and months along and remaining. It also includes a countdown meter and printable calendar. Select the event that will correspond to the date you will be selecting. Select the date that corresponds to the event the calculation will be based on. If you selected ultrasound as the event, select the weeks and days you were along at the time of the ultrasound. If you selected 1st Day of Last Period, and your average menstrual cycle is different from the 28-day norm, select the appropriate number of days. Click the "Calculate Conception Date" button. This will generate the estimated conception date, 1st day of last period date, and due date, and display a summary of the calculations. Click the "Printer Friendly Report" button to load your entries and results, including a conception calendar, in a popup window for printing. Important! My expertise is creating online calculators based on known formulas, not obstetrics, gynaecology, or paternal law. So if you have questions related to any of those fields, please seek out the advice or counsel of a qualified physician or attorney. How to calculate a conception date or plan a baby birth date. According to Naegele's Rule, the average human gestation period is 266 days. Therefore, to figure out the conception date from a birth date we need to subtract 266 days from the due date (or birth date). But since it's difficult to subtract days from a calendar date without a date calculator, the easiest way to determine conception date by birth date manually is to count backwards on a calendar. 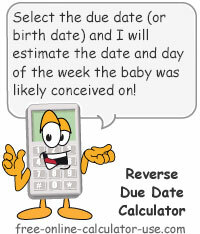 Here is a conception calendar calculator that illustrates counting from 1 to 266 days backwards from the due date. If you select the desired due date in the Reverse Due Date Calculator on this page, the calculator will tell you when you will need to get pregnant in order to increase the odds of delivering on the desired date. If you would rather know the month ranges, here is an at-a-glance chart showing target conception ranges for delivery months. Of course, there is no guarantee whether or not your baby will be born on its due date. So the best chance for having the baby in the desired month is to plan conception in the middle of the ranges listed above.